I have a rule I don’t get excited for Consoles I get excited for games. However as we’ve only seen the Switch playing a few games like the big surprise Skyrim on the go we can really only speculate on what could be coming later. So why don’t we do that. 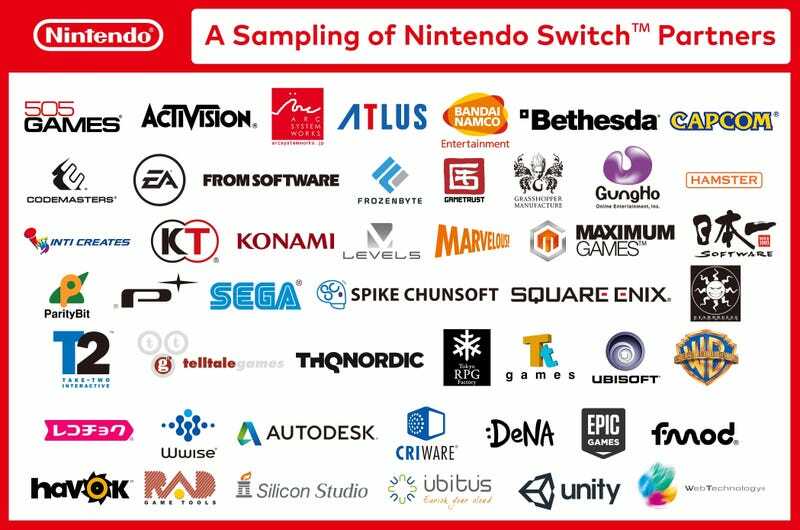 Nintendo was nice enough to show a bunch of the partners that will be working with them on the Switch. Showing at least at this juncture potential of third party support, something by the Wii and Wii U struggled mightily with. With some big names especially from Japan being found here I’ll start us off on some of the speculation. Atlus: Hoping for a port of Tokyo Mirage Session FE as a lot of Wii U games seem to be making the jump to the new system. Furthermore Atlus has also been a big partner with Nintendo on the 3DS bringing mainline Shin Megami Tensei titles to the portable. Could we see the big franchise return to a home console for the first since the amazing Nocturne? Plus if it was for the Switch that would be a major coup for Nintendo. Square Enix: We know Dragon Quest XI is coming to the Switch they let that cat out of the bag a while ago, making its Squares likely biggest contribution to the early games line up. However could we see something a little bigger, we don’t know the power of the Switch yet so XV might be out as well as the VII Remake, but who knows. After VII’s Sony limited exclusivity runs out might Final Fantasy finally return to a Nintendo Home Console for the first time since the SNES? Tokyo RPG Factory: It’s likely guaranteed the follow up to eminently charming I am Setsuna will find its way to Nintendo’s new console. Since there game always felt more at home on a portable console I think the two will be a good fit. Plus they don’t make much else to speculate about. Konami: This one caught my eye as they basically make Metal Gear and pachinko machines now. Could a port of Metal Gear Solid 5 be coming or just their weird survival game. Who knows but their inclusion is interesting to say the least. Spike Chungsoft: It’s Danganronpa 100%. At least Visual Novels will be well represented. Grasshopper: A Suda 51 game on a Nintendo console? They are going for the older crowd aren’t they as nothing Suda 51 makes is what one would consider “Family Friendly”. Level 5: I’d say it’s likely Ni No Kuni 2 as previously Nintendo and Level 5 teamed up for the 3DS version of the original. Could also be Professor Layton as well as they have a long relationship on that series as well. Koei Techmo: It’s Dynasty Warriors they put that on everything. Could also be Atelier despite its recent connection to Sony consoles exclusively. Well those are some of my thoughts, what about you guys? Any wild speculation you’d love to add especially for some of the more obscure titles on the list. I’m hopeful this may finally break the PS4/Vita’s stranglehold on interesting JRPG’s but that may be wishful thinking.